Credit Woodbury’s Max Gaede as one who stuck around. The 6-foot-3, 190-pound MSU-Mankato recruit had plenty of opportunities to leave Minnesota high school hockey a year early in an effort to advance his hockey career. But he chose to stay with the Royals to achieve his ultimate goal – winning a state championship. Though the season hasn’t started as he had hoped -- Woodbury is 4-3-0 through seven games -- Gaede leads the team in goals (six) and points (10). 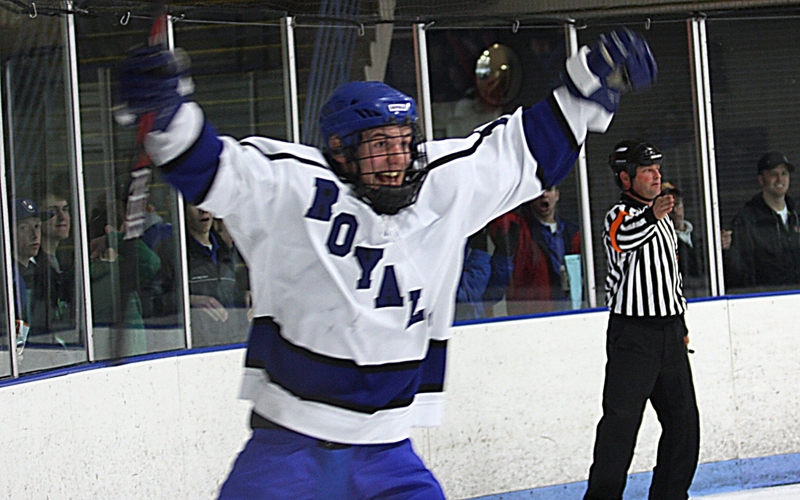 Some observers consider the Royals’ start to be a disappointment, but two of the losses have come to powerhouses Minnetonka and Edina. The shocker may have been a 4-2 home loss to rival Park last Thursday, although Woodbury did come back to shut out Stillwater in its most recent game, as Gaede had a goal in the triumph. Gaede is often in the middle of Woodbury’s success as a powerful forward with terrific offensive skills. Leading into two important pre-holiday home games this week against Forest Lake and Hastings, the Breakdown conducted an interview with Gaede about his season and the recent division of the school district into another school, East Ridge. Breakdown: What is the outlook for Woodbury hockey this winter? Is there a sense of unfinished business after missing out on the state tournament last winter? Gaede: We feel if there is a year to make a run its this one. So we are hoping for the best and are going to make the best of what talent we have in our locker room. Breakdown: Tell me about the split in the Woodbury and Park programs now that East Ridge is open. Has it been difficult on the team with some of the players having younger brothers at East Ridge? What was that first game (a 5-1 Woodbury victory on Dec. 5) like against them? Gaede: This year it was not an impact at all. Next year it will be a pretty big blow because of us graduating 16 seniors and also the classes being split after our year. It was a pretty sloppy game -- a lot of hitting and people trying to show up their siblings. In the end we showed how Woodbury is still more dominant. Breakdown: What has the process of committing to Minnesota State like? Was it a relief to have the process finished? Or did you enjoy it? Gaede: The coaches are great guys and they were really the main reason why I chose the school. It was a great weight off my shoulders committing there but also I take it as the work has just begun. I know how very fortunate I am with the opportunities I have received. I have to say it’s a big relief knowing that I will be doing what I love after high school. Breakdown: What's the best part of high school hockey and why? Gaede: Getting to play in front of our fellow students and being able to represent our high school. Breakdown: What kind of training do you do for hockey, both in- and off-season? Gaede: I do not do very much training in the weight room in season. Mostly off-season is when I am lifting. I am more of a rink rat than anything and I will skate whenever I can get ice. Which tends to be quite often because of the great friends and people who I have met over the years. Breakdown: Give me a short scouting report on yourself as a player. What are your strengths on the ice? Gaede: (I’m) strong on the puck, smart and I feel I move the puck and use my teammates well. Breakdown: This is the cliché question, but what player did you grow up following for style of play? Gaede: I have always been a Joe Thornton fan because of his great vision. Breakdown: Can you tell me one unusual thing about yourself that others may not know? Gaede: I can ride a unicycle and did once in a parade. Breakdown: What is your favorite memory of playing hockey and why? Gaede: When I was a first-year Bantam, I was up in Grand Forks at the Ralph Engelstad Arena playing a tournament with some AAA summer team. I got to the rink before everyone for some reason that day. I went about two hours early. I was walking around the rink kind of bored and walked up to the practice rink and saw some Sioux players goofing around on the Ice. I watched for a while and eventually gained enough courage to ask if I could join them. They said yeah and I ran back and got my skates on. Once I got out there they all decided to play a 3-on-3 game so we split up and I could not believe I was playing a pick up game with DI players. So we get started and I get the puck. I took a slap shot at the goalie and hit him in the neck and he went down. Once I got over I found out it was not the Sioux's goalie I was shooting at, it was the Sioux's best forward, T.J. Oshie. So now I am feeling just terrible that I hit him, not knowing he was just in the net for fun and not knowing that he would be a stud in the NHL today. Not my best play.